Keep your lips protected from the elements in all types of weather. 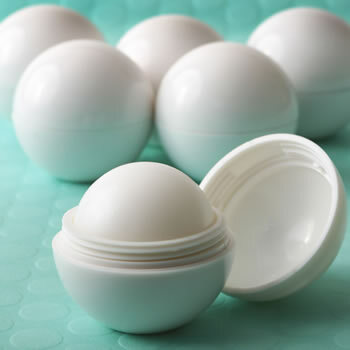 This handy ball shape luxurious balm can easily slip into a pocket or purse. The luxurious lip balm ball comes in a cute round plastic ball case, a convenient size for carrying in a pocket or purse. A screw on top keeps the lip balm secure and clean. The lip balms balls are bulk packed in poly bags. A functional and fun gift idea to offer at baby showers, bridal showers and ladies luncheons. Also makes a great give-away for hair and nail salons to offer clients as a welcome gift.